Head 60km south from Colombo to find many miles of beautiful sandy beaches and mangrove lined lagoons. As the road and railway follow the coast you may take a fast and, possibly scary, trip in an air conditioned bus or express train, or plan a leisurely journey by car enjoying the numerous resorts en route. Kalutura is entered by way of the double-span Kalu Ganga bridge and a roadside Boa tree where you may stop and make an offering at the magnificent temple to ensure a safe journey. The back in-land roads will lead you through many rubber estates, past ancient temples of over 1000 years and hidden waterfalls where you can take a dip with the locals- beware, they will stare as they bathe fully clothed. As you approach the coast line you will discover locals pulling in the catch of the day or preparing nets. Arri ve in style from the airport by taking the sea plane to Bentota River. Bentota & Aluthgama have become synonymous with many large hotels and Sri Lanka’s finest beaches. Tourist-wise there is a mixed International influence and a little more commercial. With the lively fish markets, the towns are divided by the Bentota Ganga. The broad, sandy, gently shelving beach has calm, warm waters on two fronts- the sea where the swimming is generally safe and deep sea fishing and diving can be arranged and the River where you may try water s kiing, wind surfing or take a cooling, lazy boat ride up stream and through the mangroves. Not quite “Bateau Mouche” but when did you last see a water monitor, crocodile or Kingfisher in Paris? Don't worry, water sports operate at the salt water mouth of the river and the crocs reside upstream in the fresh water! Though some choose to stay cocooned within a 4/5 star hotel here, you can opt for the many beach side boutique hotels or villas that we have discovered, - Club Villa a design of the famous and award winning architect Geoffrey Bawa and Sinaguwa further South in Balapitiya. Watch the sunsets with cocktails at the beachside guesthouse, where you can absorb the Sri Lankan spirit and enjoy the local seafood. Or immerse yourself in the friendly village community at colonial villa Nisala Arana. The beaches are also home to the Giant Sea Turtles. Visit the hatchery at Kosgoda which has prepared, protected beds of sand for the eggs, laid annually and large tanks to view the young before they are returned to the sea. If you would like to combine the environment with nightly entertainment – disco, bongo’s or live reggae at the beachside bars and restaurants. The South West is also well known for its Ayurvedic centres. The East’s answer to healing through herbal medicine and a perfect way to destress, detox and rejuvenate the body after intense hospitalization or operations. To experience the true effects of Ayurveda, a two week stay is recommended. Head in-land to the Brief Gardens, a 25 acre estate landscaped by Bevis Bawa (brother to Geoffrey). The garden has many “rooms” to delight and a visit to the living Art gallery House and surrounding waterfalls can be arranged. Continuing South you may enjoy the best of Sri Lankan Handicrafts and artistic skills- basket weavers, papier mache workshops, batik paintings, antique colonial furniture and the famous mask carvers and devil dancers of Ariya pala and Ambalangoda. 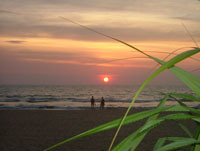 Hikkaduwa (40 minutes from Bentota) is the most commercial of Sri Lanka’s coastal resorts. Crowded with nightclubs, tourist stalls, water sports centers, and tourist shops, it is worth a visit. We have not found any hotels in this area that escape the package holiday and provide for the discerning independent traveller. Wind through many coastal villages and pretty bays when you choose to stay at the many luxurious beach side villas - ideal for groups of friends. Or release all tensions as you begin your holiday by combining the sun with daily yoga rituals enjoyed at many hotels on the South West border with Galle and the South coast.